3rd period collapse costs Pens 2 points and their dignity. There are some bad periods of hockey, and then there is the Pens' third period vs Boston. The phrases "wheels fell off," "couldn't hold on," and even "epic disaster" would be an understatement to this period. There is no other way to describe it. Instead of rambling on, I will present some stats. Boston took 13 shots in the 3rd period and made 5. They took 20 in the first 2 and only converted 2. Boston did not have a single powerplay in the 3rd period, yet they scored 5 goals. Only one of those 5 goals was an empty net goal. Matt Cooke was the only Penguin who finished a + for the game. The Pens finished the game with a total of 45 shots, and lost. 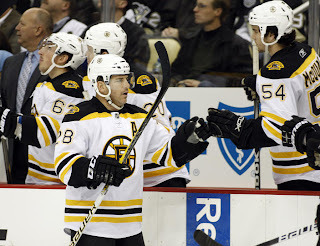 The Bruins put a 7-spot up without top centers Krejci and Savard. And perhaps the most revealing stat.....Only 3 of Boston's 18 skaters finished the game without recording a point. I guess you get what you ask for when you choose not to come out and play 3 periods. Nobody can argue that the Pens didn't play 2, and they played them well. Sidney Crosby recorded 3 points as well as a powerplay goal and continued to advance himself up the list in both points and goals. Brooks Orpik recorded a rare goal after he (also rarely) jumped into the offensive play with a wrister from the side. Arron Asham got his first ever goal as a Penguin just over 1 minute into the game. Things seemed off to such a good start. What happened? I could probably make up a conspiracy theory about how the entire team hired stunt-doubles to play the 3rd period and had already left Consol Energy Center by the time the buzzer rang for the start of the 3rd, but perhaps the more likely explanation was that the Pens just got too comfortable with their 2 goal lead. The got the very late goal in the 2nd and simply thought that this one was already in the bag. Well, as the old saying goes..."Complacency is death." When the zamboni cleaned the ice clean during the 2nd intermission. Offense- B+ 4 goals against the NHL's hottest goaltender is nothing to snuff at, but they just couldn't get it done in the 3rd. Defense- C- What happened? Turnovers, missed assignments, laziness. Pretty much everything that drives a coach out of his mind. Johnson- D I don't know if he got a relapse of his illness in the 3rd period or if he just fell apart, but those some of those goals were inexcusable. Fleury should by all right be in net on Friday. Powerplay- A- The most ironic part is that the powerplay wasn't bad. They went 1-2 with some decent puck movement and shooting. Maybe it is an inverse type of thing. When the powerplay is bad, most everything else is good and when the powerplay is good everything else is bad? Maybe. Penalty Kill- B- Let in an early PPG and killed the 2 penalty afterwards. Mediocre. -The officials weren't exactly on their A Game. I'm not saying it would have changed the outcome of the game completely, but there were several instances where the Pens got the short end of the stick, including 2 obvious ones. The entire fan base held their breath after Malkin collided with Shawn Thornton and was motionless for about a minute. The contact was clean but Geno didn't have the puck. No interference call. The other bad no-call happened late when the Pens were down 5-4 looking to tie and Crosby took a stick to the face and started to bleed. Not only did the Pens not get the 4 minute PP, they didn't even get a 2! -Another physical game that featured 3 fights (Godard, Talbot, Asham). The Pens now lead the NHL in fighting majors. I'm not sure I like that stat, because fights mean nothing if you cannot back them up with points. -Bag skate in practice tomorrow? I'm sure Dan Bylsma doesn't read this, but that would be my suggestion of how to punish the team for what happened yet move past it at the same time. Nothing helps you forget your frustrations about a rough loss like a brutal practice.